The story of RAMA sung by saint TULSIDAS grants one's desires like Kamadenu (celestial cow) .It is like Vedas. It is a mine of the four fold rewards of human beings namely religious merit, prosperity, sensuous enjoyment and liberation. It is a source of definite delight and delights the heart by its very presence. It is a bridge for people who wants to cross the ocean of mundane existence. Tulsidas had marvelous faith and devotion. Raamacharitmaanasa of Tulsidas has charm of devotional spirit. The world has not yet fully recognized the merits of this incomparable work. This work is a source of infinite joy and is a gift to the entire human race. Blessed are those who recite or listen to Maanasa Ramayana of Goswami Tulsidas. To know Tulsidas's Ramayana is to know all that needs to be known. It possesses unique power. This is the reason why It is sung with love and devotion to this day. It is true that Tulsidas has given the highest truths of religion and philosophy, in a charming, graceful and plain language in such a way that even an ignorant person could be benefited by It. It commands great respect from rich and poor alike. Written Centuries ago, It still retains a freshness and charm almost unrivalled in the literature of the whole world. 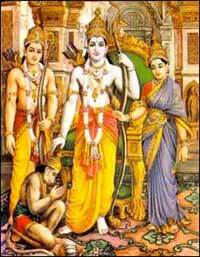 There can be no one who can not be thrilled and inspired by the great events and noble ideas of the Ramayana. It had done a great service in the domain of spiritual development. God realization is the highest goal of human existence and this can be attained by reciting or listening to Raamacharitmaanasa. Surrender to lord is the best means of attaining salvation. Vibhishana is a typical example of such surrender. Millions of devotees have drunk from IT TO FILL THEIR HEARTS with nectar of JNANA, BHAKTHI and VAIRAGYA; and till the end of this creation many more will continue to derive unique joy and solace from this Maanasa. Hence blessed are those who recite or listen to this great work of Tulsidas's Raamacharitmaanasa.